Police Officers Alyn Beck and Igor Soldo were shot and killed from ambush while eating lunch at a pizza restaurant in the 300 block of North Nellis Boulevard. Two subjects, a male and a female, approached them at their table and shot them execution style without warning. The subjects then stole both officers’ weapons and ammunition and ran to a nearby Walmart, where they shot and killed a civilian. Responding officers followed the two into the Walmart and exchanged gunfire with them. The male subject was killed by rifle fire from a responding officer and the female then committed suicide. 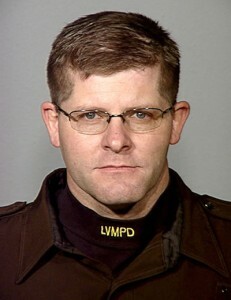 Officer Beck had served with the Las Vegas Metropolitan Police Department for 14 years.